Get your creative juices flowing and you could win FREE juice! Get your creative juices flowing with Old Orchard! This month we will be hosting a Creative Coloring Contest for all ages! With your creative masterpieces, you could win Free Juice for a Year and be set for rest of the school year - Woah! For participants younger than 13 yrs old, a parent or guardian must sign the participant's entry. Download, Print & Color any of our FREE coloring pages found here however you like! Color in with crayons, markers or paint, the options are endless. Entries must be original & creative! OR submit your entry on Twitter, Instagram or Facebook, tagging Old Orchard's social media account and using the hashtag "#OOColoringContest" - and be sure to include your age group! Free Juice for a Year! We will select one Grand Prize winner from each age group! NO PURCHASE NECESSARY. A PURCHASE WILL NOT INCREASE YOUR CHANCE OF WINNING. This promotion is sponsored by Old Orchard Brands, LLC, 1991 12 Mile Rd., Sparta, MI 49345 (“Old Orchard”). NO PURCHASE NECESSARY. To enter, download, print and color any of the three free coloring pages found here: https://oldorchard.com/uploads/games/coloring-pages.pdf. 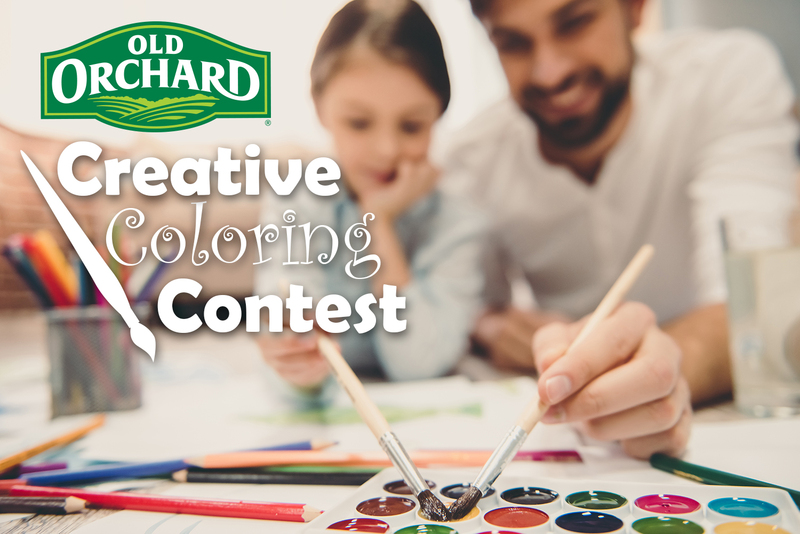 Once your masterpiece is completed, fill out the entry form found online at https://oldorchard.com/promo -- including your contact information and upload your colored masterpiece, or, submit your entry on Twitter, Instagram or Facebook, tagging Old Orchard's social media account and using the hashtag "#OOColoringContest" along with the age of the entrant. Alternate entry by mail: mail in a physical copy of your completed coloring page and a 3" x 5" index card with your name, age and e-mail address to: Creative Coloring Contest, Old Orchard Brands, 1991 12 Mile Rd., Sparta, MI 49345. Sweepstakes and contest begins August 30, 2018 at 12:00am ET. All entries must be received by September 30, 2018 11:59pm ET. There is no limit to the number of entries you may submit. Each unique, eligible entry will constitute a unique sweepstakes entry. The promotion is open to all legal residents of the United States. For participants younger than 13 yrs old, a parent or guardian must sign the participant's entry. The promotion excludes employees and immediate family members of Old Orchard and its parent companies, subsidiaries, affiliates, assigns, advertising, promotional and fulfillment agents, attorneys, and other representatives and the persons with whom each of the above are domiciled. 3 Grand Prize Winners will be chosen by Old Orchard out of all of the eligible entries and judged by the following criteria: createive, original and submitted their masterpiece correctly via file upload, social media, or via mail. One winner from each age group will be selected by Old Orchard Staff.Limit one winner per household. All winners will be contacted via the email address provided or via the social media account of entry; prizes will be sent via USPS or FedEx. Any selected winner that does not respond within 7 days of notification will forfeit their prize and an alternate winner will be selected. The Grand Prize winners will receive Free Juice for a Year in the form of 52 Free Product Coupons, each redeemable for a free Old Orchard juice product, up to a $3.69 value; and an Old Orchard Prize Pack filled with fun, logo'd merchandise. Approximate retail value of the Grand Prize $200. All prizes are non-transferable and cannot be sold or redeemed for cash. Old Orchard may substitute a cash payment or substitute prize of equal or greater value at its sole discretion. Any federal, state, or local, taxes are the sole responsibility of the winners. Old Orchard is not responsible for any lost, damaged or misdirected mail. Prizes will be awarded providing there are at least 3 unique, eligible entrants. For the names of prize winners, send a self-addressed, stamped envelope (postage not required from Vermont residents) to Old Orchard Attn: Summer Selfie Sweepstakes – Winners List, 1991 12 Mile Rd., Sparta, MI 49345. All requests for a list of winners must be received by 11:55 p.m. ET on Octover 10, 2018.